General Mills is one of those companies we all grew up with and trust to bring us a good quality product. Well, thanks to the good folks at General Mills and My Blog Spark, I was able to try out some awesome General Mills cereals. I was sent 4 coupons for 4 free boxes of cereal. 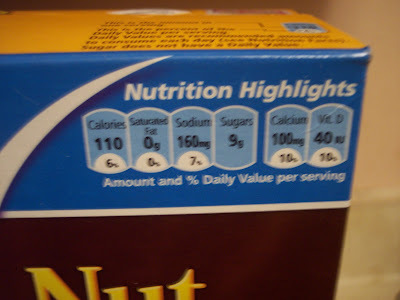 They will be lowered the sugar in their cereals and I am thrilled with this! We eat a lot of cereal in this house and it is really one of the major favorites of the Little Princess. Ask her what she wants for breakfast and she instantly says, "Cereal-an-milk". This comes out as one word. General Mills announced a commitment to further reduce sugar in cereals advertised to kids under 12 to single digit grams of sugar per serving. The company has already been reducing sugar in cereals while increasing key nutrients, such as calcium and vitamin D, and providing whole grain. Okay, my picture is so great, but isn't it nice to see this information so clearly and not have to try and read the fine print? I really like this idea. 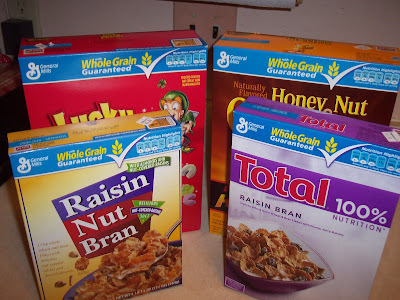 You can get a coupon for $1.00 off of a box of General Mills cereal HERE! I want to thank General Mills and My Blog Spark for giving me the opportunity to try these cereals. I did NOT receive any compensation for my opinion. I received 4 coupons for a free box of cereal each. My opinions are completely my own. I love Honey Nut Cheerios, one of my fav cereals. My kids grew up eating cereal for breakfast! Good Stuff! I have cheerios and honey nut cheerios frequently. I snack on them both also. Sorta like chips or something.